Discover the charming Bed and Breakfast Casa Domingo, centrally located in Andalusia, Costa del Sol ! 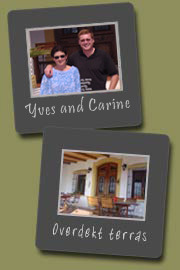 Our B&B Casa Domingo is centrally located in Andalucia, it is the ideal base for discovering the real Spain ! Specialist Caminito del Rey! Welcome to B & B Casa Domingo, holiday in a charming bed and breakfast hotel in Andalucia on the Costa del Sol! In B & B Casa Domingo you stay in a beautifully restored finca, surrounded by the Andalusian countryside. Agriturismo in Spain at its best with a passion for beautiful walks in the area. The picturesque village of Álora is situated at only 5 minutes by car with lots of nice cafes and restaurants. BandB Casa Domingo is only a 40 minute drive from Málaga airport and the Costa del Sol. Centrally located for visiting Malaga, the seaside, Ronda, Granada, Cordoba, Seville and the real, unspoilt nature of the interior of Spain! The roads are good and the traffic is quiet! You can make full use of the hosts that are well established, fluent in Spanish and can assist you in case of emergency. There is a hospital just 10 minutes drive from the B & B Casa Domingo. In the morning you will be spoiled with a rich buffet breakfast (including fresh fruit juice and fried, baked or boiled eggs of your choice), while enjoying 'al fresco'the stunning panorama of the "Valle del Sol" on warmer days. In the evening you can admire the sun setting behind the mountains while enjoying a glass of cava, wine, a nice Belgian beer (Duvel, Leffe, Westmalle Trappist Tripel) or ...guaranteed good nights sleep ! With free WIFI , free bed linen and towels in the bathroom (including studios and apartment), final cleaning for free,library, free parking, swimming pool (10m by 6m. ), beautiful gardens, free tennis court (bring your own rackets), a welcome drink with detailed introduction of potential restaurants and outings since we represent the tourist office of the region ! Late arrival or early departure no problem, the host is always there for you! You will discover the beauty of nature and get to know the real Spain. The atmosphere is cozy, casual, relaxed and personal in peaceful surroundings. A body massage is available onsite. An ideal guest spot to dream and to live a real holiday feeling. Many self-designed walks, both for beginners and advanced, both for summer and for winter. We offer a detailed description of every walk and of the way to go and return, so nobody gets lost! Detailed information about the Caminito del Rey is available as well as the opportunity to walk the trail without prior reservations for guests who stay minimum 4 nights with us. Tickets for the Kingspath for free and a walking holiday never to forget ! Relaxing, sports, cultural, culinary ... everything is possible ! ! Treat yourself and enjoy the nice weather, eat delicious food, enjoy the combination of nature and culture, sun, sea, beach and mountains and of course the most friendly people in the world ! We will send as soon as possible a final confirmation via e-mail ! Follow us on our blog and join now!